These cakes were made for an old friend of mine, Amanda. Amanda and her hubby had a beachside wedding last week and a reception here, this weekend. 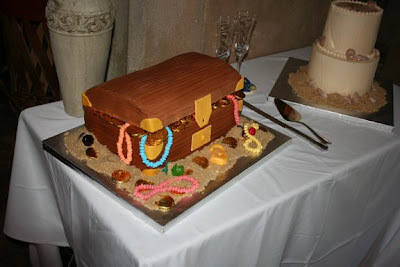 They decided to keep the beach theme for the reception and requested a treasure chest and a simple ivory cake with seashells. The treasure chest is 2 quarter sheet German chocolate cakes covered in chocolate buttercream. The lid is rice kripsy treats and the accents are fondant and candy. The sand is a mixture of crushed vanilla wafers and golden brown sugar. I really love making these cakes. 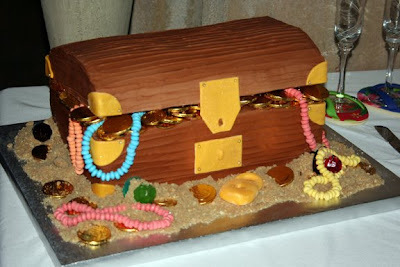 I would totally make a treasure chest every week if someone wanted me to! The bridal cake's bottom tier is vanilla cake with cream cheese filling. The top tier is vanilla cake with coconut cream mousse. 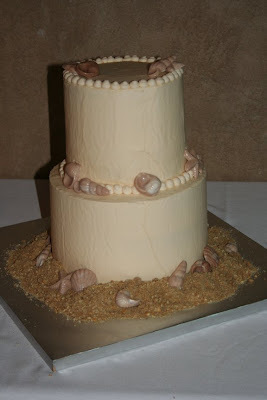 The entire thing is covered in vanilla buttercream with white chocolate (tinted brown) seashells. I also made an additional 50 shells so that everyone could have a shell. This cake had some issues. The temperature changes from day to day is killing my dependability with my buttercream. I iced this cake when it was in the low 40's and today when we drove it to the reception site, it was in the high 60's. This changed the buttercream and caused it to slide and crack slightly. It drives me absolutely crazy when things like this happen but seriously, no one else ever notices. Also, this is a big reason most wedding cakes are done in fondant. Fun cakes, I enjoyed making these! Getting ready for 4 major cakes this week, including 2 wedding cakes...1 of which we are driving to VEGAS! Have I told you lately how incrediably talented you are? These cakes, as always...are amazing. wow, i way spelled incredibly wrong...but you get the point. you guys are so nice! even though you know I'm not happy with the bridal cake. 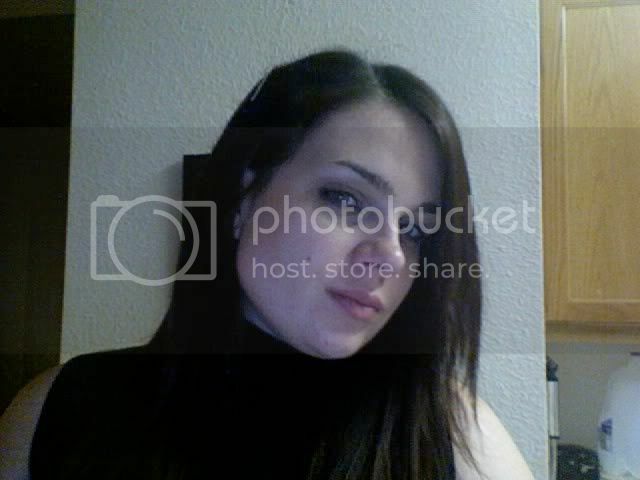 amber ---- I missed you yesterday! ahem, ahem. Some might even say a rebel.